The Saab 9000 was the final vehicle designed in house at Saab and brought to market by the funky Scandinavian OEM before it was fully acquired by the machine known as General Monster...I mean Motors. The 9000 was built on the Saab/Fiat type 4 platform (1984-1998 Lancia Thema, Saab 9000, Fiat Croma, Alfa Romeo 164) and features executive class luxury, front drive safety, and Giorgetto Giugiaro styling...and the best part is that they are cheap and easy to modify to go fast. Find this 1992 Saab 9000 Turbo offered for $1500 firm (12/28/2017, price reduced) via the grassrootsmotorsports classified forums and here on DT. 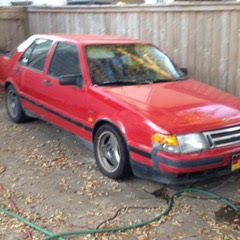 1992 Saab 9000 turbo track car, 5 speed manual trans. Stock 2.3 liter, 4 cyl. 16 valve engine and T25 turbo, factory intercooler and oil cooler. Around 1k miles on professionally rebuilt head and turbo, new suspension (Bilsteins, B&G springs, urethane control arm and sway bar bushings, new rubber bushings elsewhere, camber bolts, new brake lines), Sachs clutch kit. Lots of new parts (including pretty much all sensors and sending units and middle muffler). Gutted interior (no rear seats, no stereo, no carpet, no HVAC, deleted sunroof). Race seat, harness, extra gauges (oil temp & pressure, boost). Balance shafts disconnected (less smooth but more power). Motor mounts filled in (little more vibration but stiffer drivetrain). Battery relocated to rear. R-compound front tires and RS-4 front brake pads. One spare full size wheel (tire needs replacing). Second muffler replaced with custom pipe (not loud). Deleted traction control system (running 1991 non-TCS ECU with aftermarket chips). Has working lights, turn signals, power windows, and wipers (it is registered). I have a lot of time and money in this car after 5 years of ownership, but I recently got a project car and wife says one has to go. Guesstimate it makes around 225 bhp. This is a great track car for someone who wants something different than the usual suspects. Car is light and fast. Clean title. $2,017 firm. Tempting. To keep life simple, I prefer a track car that can be driven to the track, and this one seems to qualify (as long as the track is not TOO far away!). Unfortunately in my jurisdiction, this one would still be subject to emission testing. With the mods, I wonder if it would pass? if you put a cat on it I think it would pass no guarantees obviously. i have the original chips as well.